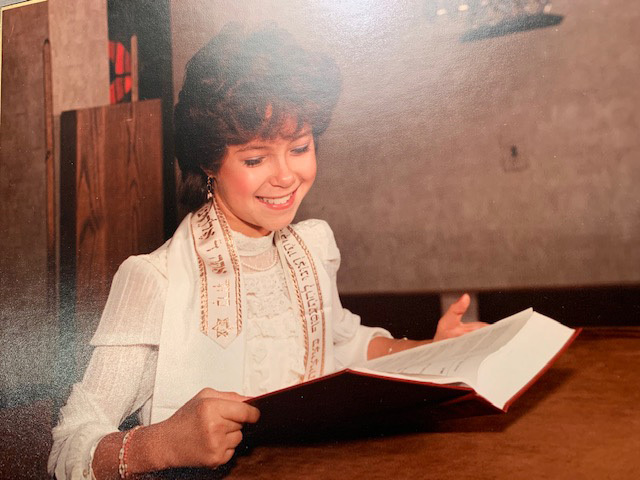 I wore a white frilly dress and my grandfather’s tallit (prayer shawl.) My hair was permed and my braces had recently been taken off for the event. I felt strong and filled with pride. I was continuing my family’s tradition and it meant something to me. I remember so clearly what it felt like to stand up in front of my friends and family and tell them about how I wanted to contribute to the world and about how the experience of preparing for the special day had changed my perspective. I felt it then and looking back, I still feel that now. The decision for us to make Mitzvah Videos at Portraits That Move may seem like a bit of a left turn, since so much of what we do is about capturing the average day in the life of kids and their families. It actually isn’t and here’s why. To me, life is all about the following truths: family, closeness, celebration, tradition, joy and gratitude. Every day that we create videos for Portraits that Move, I have these truths in mind. Making mitzvah videos allows us to create something that is about all of them at one time. Bar and Bat Mitzvahs are celebrations with family. They are filled with joy and tradition. I see a wonderful opportunity to enrich the experience that a family is having by giving them the chance to document their own feelings about the process. This is super empowering for kids and for parents. The result is something that they have to share with their guests and to look at and remember forever. The empowerment of going through a mitzvah process cannot be underestimated. It can be a defining moment for a child. We want to be part of that - to document that shift and to celebrate, celebrate, celebrate. Let’s celebrate together.